Animal upon Animal is a fairly new acquisition for me (I bought it in 2014), but its ageless quality–both in gameplay and in its universal appeal to all players–makes it a perfect subject for The Dusty Dragon. Join me as I explore this charming dexterity game. 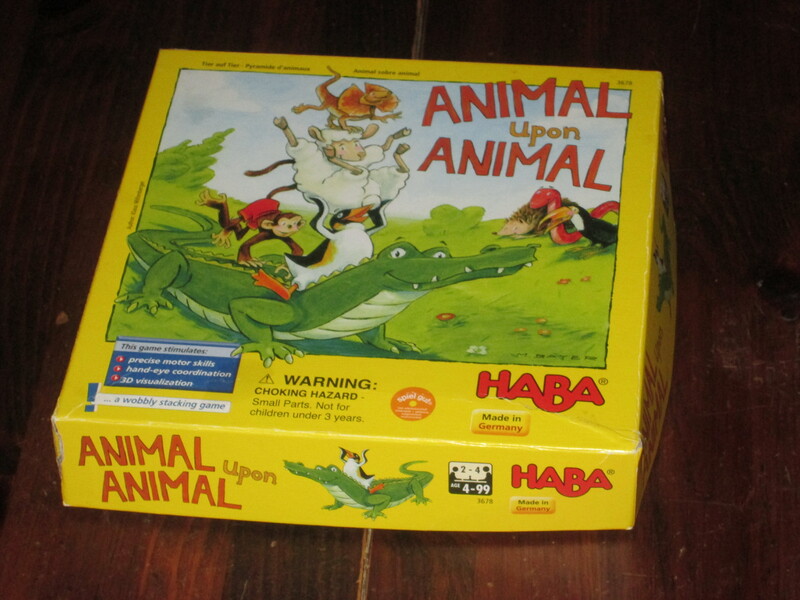 Animal upon Animal is a stacking game for two to four players. 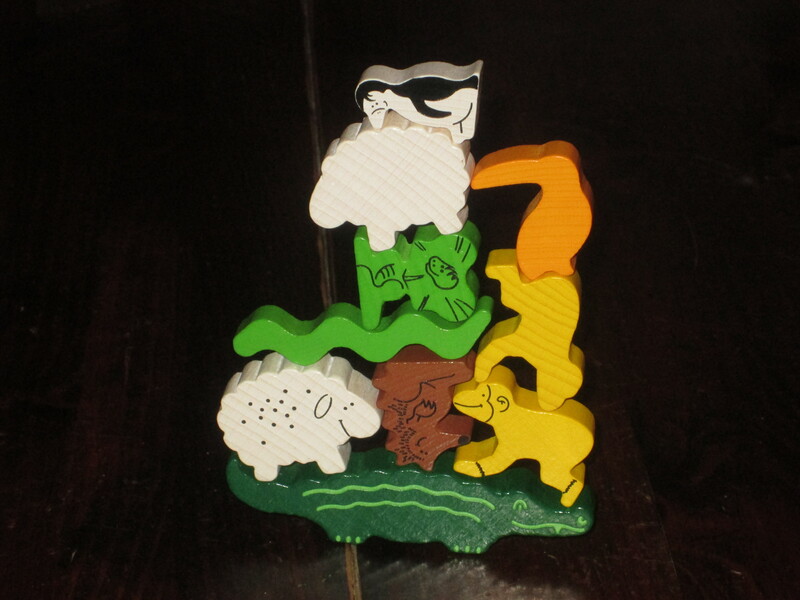 The first player to place all of his or her animals onto the animal tower is the winner. 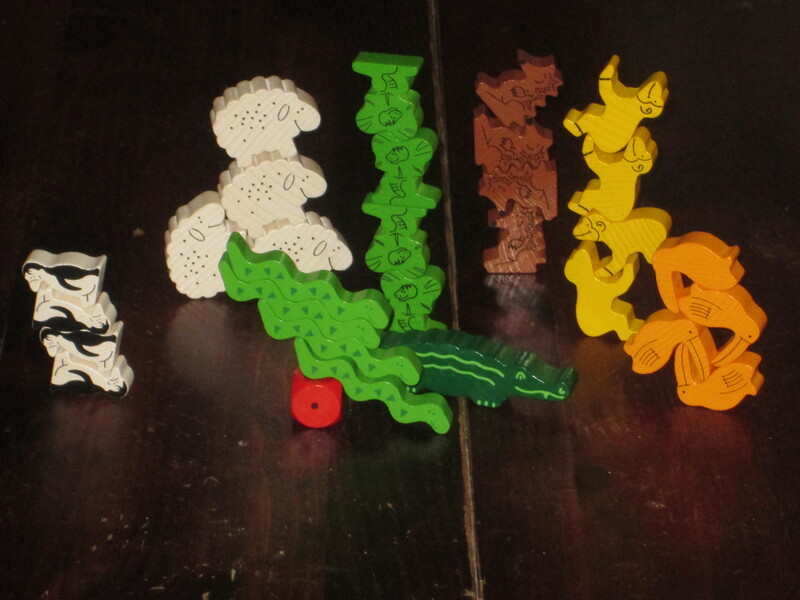 Each player receives an identical supply of seven animals. The alligator piece is placed in the center of the table. Each turn, players roll the die to see how to place their animals onto the tower. If, in placing their animals, they cause any animals to fall off, they must take these animals into their supply (up to a maximum of two animals for children or five animals for adults). Once a player runs out of animals in reserve, that player wins. 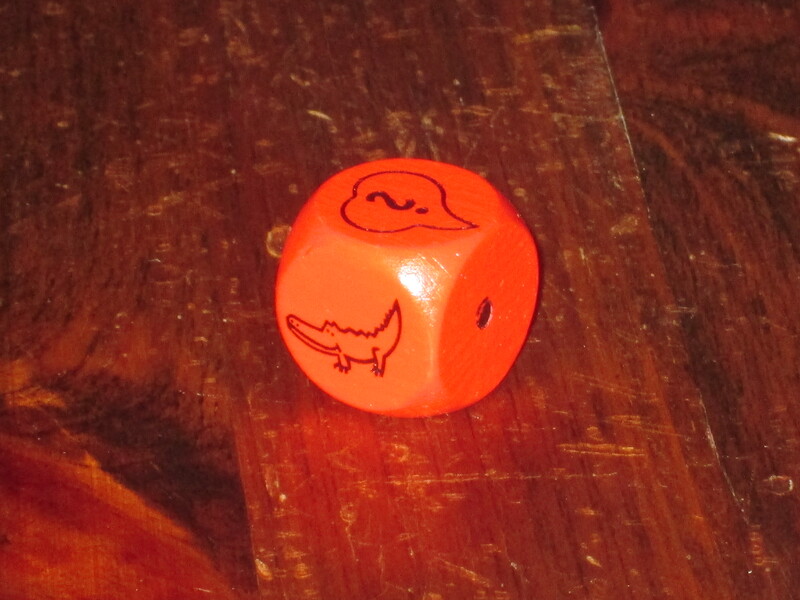 Included in the box are seven different animals, four of each; one alligator; and one red die. Also instructions in several languages. Animal Tower, or Animal Tired? Animal upon Animal is ostensibly a children’s game. 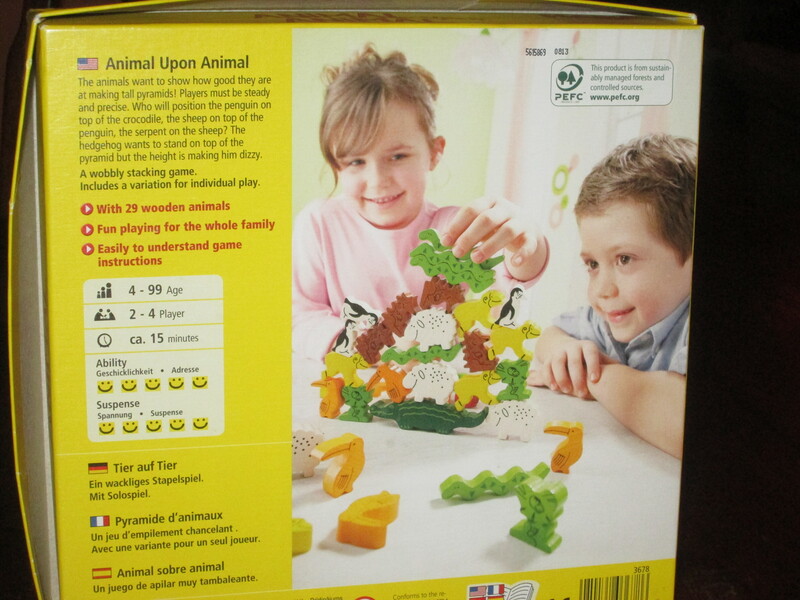 On the back of the box, the benefits for children’s fine motor skills are touted, and we are treated to a photograph of children excitedly(?) placing one animal on top of another. “Mom, look what I can do!” The back of this box might tell gamers “Stay away–there be dragons here,” but the game is great for kids, adults, newbies, and seasoned pros alike. While it’s true that Animal upon Animal is (and works well as) a children’s game, it is also a whole lot of fun for adults, too. In fact, most of my games have been with adults exclusively, and it is charming and challenging enough to vie for the top position in my pantheon of dexterity games. There are several things that make Animal upon Animal so great. The first is the components. The animals are fun shapes made out of sturdy wood in bright colors. They are fun to hold, and the game looks great when it’s on the table. Inevitably when I drag it out for the first time with a new group, they quickly evaluate and are ready to dismiss the game before playing. Too cutesy, too kiddish. But then, once they hold the chunky animal pieces, they realize the charm too. The components are not just fun to look at and hold; they are wonderfully functional. Yes, it seems like just about anything would work if you’re trying to make a stacking game, except maybe all spheres. But the animal pieces in Animal upon Animal are particularly fantastic. You look at the pieces the first time, and you think, “There’s only one way to stack a sheep.” But as the game progresses, and you’ve held on to that sheep waiting for the perfect moment, and there are no more perfect moments to be had, you realize that you are more creative than you thought. Necessity is the mother of invention, and you find that maybe, just maybe, there’s more than one way to place a sheep. The pieces all have strange juts and quirks, and surprisingly, they can be balanced and counterbalanced in myriad ways atop the central alligator. It is the stupid-human-tricks nature of the game that makes Animal upon Animal so much fun to return to. While all the players are trying to win, it’s just so enjoyable to see what your friends can do and to see how they each evaluate which animals to place on the tower. Do they place the hard animals first, or do they save them for the end-game, hoping they roll the alligator symbol (allowing them to add an animal to the base of the tower) or the hand symbol (allowing them to pass the animal to someone else for that player to place). It’s fun to see where they place animals, and whether they take the easy way out or try to make a work of art. Look at these animals stacked together. Quick, let’s get a photo for Twitter! And, indeed, there is a sense of accomplishment at the end of every game (at least when that game doesn’t end in complete collapse). Almost every group I’ve played with has, at one point, suggested that we take a picture of the finished tower for posterity’s sake. Yes, the majority of these pictures are deleted immediately when photos are examined later, but the point is, Animal upon Animal is the kind of game where you feel like you’ve built something at the end of it, and you want to show it off. I’m speaking mostly of playing Animal upon Animal with adults because that’s how I’ve had the most fun with it. However, it works excellently for its intended purpose as a children’s game. My five-year-old niece loves the game, and she balks when I tell her that I’ll let her take back only two animals to my five when pieces fall off. (She could really benefit from this handicap, but pride runs high in my family.) My ten- and eight-year old nephew and niece also love the game, and you can see the increase in skill and bravado that just a few years bring. It’s fun to play with them because it’s a game we can all enjoy without getting bogged down in rules, and the strange skill required in the game makes us all (more or less) equally matched. (Such is the fate of having sausage fingers.) Even my son, who is too young to play the game by the rules, enjoys the pieces too–especially the red die, for whatever reason–and he takes great joy in knocking down the animal structures I build for him. The red die of destiny or doom, depending on your take. If there’s anything negative to say about the game, it’s that the red die sometimes makes for lucky or boring situations. In one game, player after player rolled the alligator symbol, meaning we had what felt like an infinite base upon which to build our tower. Or in another game, a player won by rolling the hand symbol almost exclusively. These situations are boring, and you might think, Just eliminate the die. That’s one way to “solve” the problem. Another is simply to play again. There are enough interesting situations with the die and the die is enough of an equalizer when playing with young players that I always use it despite the outlier situations. The game is also more fun the more players you have at the table. My wife and I thought the game was a little dull with just two players (a little improved if you take 14 animals instead of 7), but it is simply fantastic with three or four. 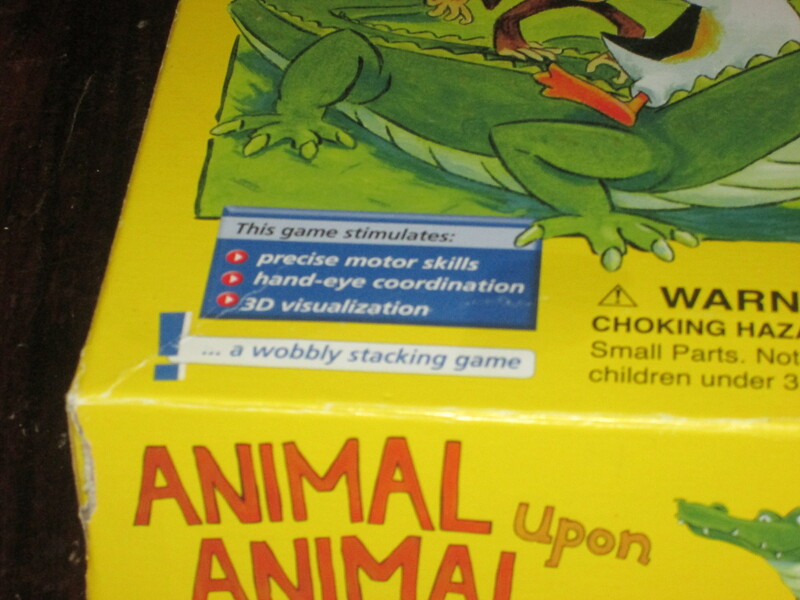 Animal upon Animal has several spin-off games that can be played on their own. These spin-off games also include new animals that you can use in the stacking Animal upon Animal game to keep things fresh. At one point I purchased Animal upon Animal: Balancing Bridge for the additional animals (I didn’t care for the spin-off game), and while it was cool to play with jaguars and giraffes, I ultimately sold the addition because the base game is fun enough without them. Believe me: there are enough odd situations caused by animal protrusions that you are unlikely to see the same game of Animal upon Animal twice. You should play this game because it will help you with hand-eye coordination and fine motor skills. Animal upon Animal is now ten years old, and the design has aged very well. It’s a game I’m always willing to play and often seek out, particularly as a game to loosen a small gathering up. It doesn’t take a lot of brain power, and it facilitates conversation by getting players to laugh at their own failed gambits and marvel at their opponents’ dexterous balance. Animal upon Animal is an excellent bridge between children’s games and adult games. 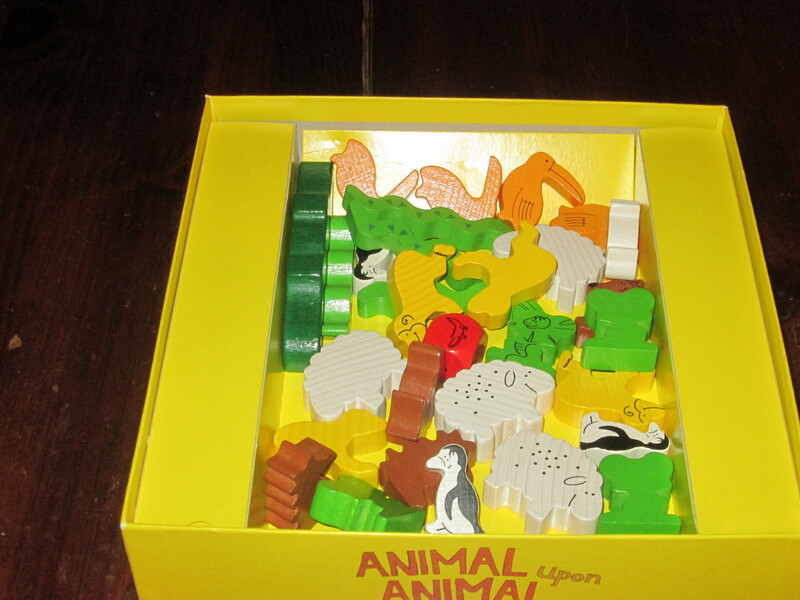 If there is a list of games that should be on every hobby gamer’s shelf, Animal upon Animal belongs on that list.